Collection PUF / Frémeaux - JULES CÉSAR, UNE BIOGRAPHIE EXPLIQUÉE - FA5559 – Frémeaux & Associés. This is the ninth volume of Frémeaux's biography collection. 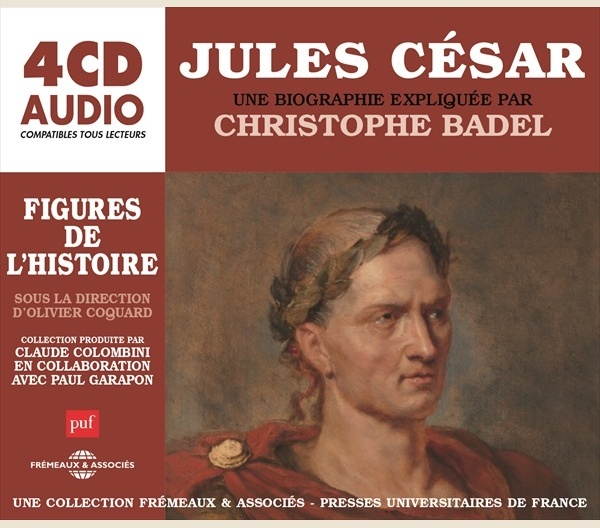 Co-published with famous publisher "Presses Universitaires de France" (PUF), this collection delivers historical lectures on Historical characters by the best specialists. A 4 CDs set. In French. 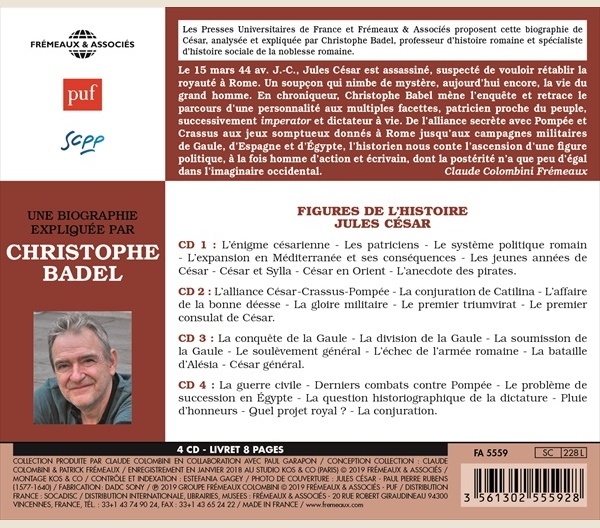 CD 1 : L’ÉNIGME CÉSARIENNE • LES PATRICIENS • LE SYSTÈME POLITIQUE ROMAIN • L’EXPANSION EN MÉDITERRANÉE ET SES CONSÉQUENCES • LES JEUNES ANNÉES DE CÉSAR • CÉSAR ET SYLLA • CÉSAR EN ORIENT • L’ANECDOTE DES PIRATES. CD 2 : L’ALLIANCE CÉSAR-CRASSUS-POMPÉE • LA CONJURATION DE CATILINA • L’AFFAIRE DE LA BONNE DÉESSE • LA GLOIRE MILITAIRE • LE PREMIER TRIUMVIRAT • LE PREMIER CONSULAT DE CÉSAR. CD 3 : LA CONQUÊTE DE LA GAULE • LA DIVISION DE LA GAULE • LA SOUMISSION DE LA GAULE • LE SOULÈVEMENT GÉNÉRAL • L’ÉCHEC DE L’ARMÉE ROMAINE • LA BATAILLE D’ALÉSIA • CÉSAR GÉNÉRAL. CD 4 : LA GUERRE CIVILE • DERNIERS COMBATS CONTRE POMPÉE • LE PROBLÈME DE SUCCESSION EN ÉGYPTE • LA QUESTION HISTORIOGRAPHIQUE DE LA DICTATURE • PLUIE D’HONNEURS • QUEL PROJET ROYAL ? • LA CONJURATION.